After buying my sombrero de paja toquilla in Cuenca, I took a bus to Loja, then another across the border into northern Peru, Piura, and another on to Chiclayo. The buses are decent, super cheap considering the distances we are covering. The AC works to the extent that it’s really cold when it’s cold outside in the morning, and really hot when it’s hot outside. Watching the world go by through the windows is part of the experience, so much richer than travelling by plane. As we left one bus terminal, there was an horloge fleurie on the grass bank, a small reminder of Geneva. Further along, a row of restaurants, each with a whole pig dangling from a peg at the entrance. Well the first one was whole, the rest were in varying states of undress. Not such a familiar sight in Geneva. We passed a gold mine on the right, sugar cane fields on the left. And one moment we were driving through fog, the next we were high above the clouds, just like the magic of going skiing in the mountains of Switzerland. The entertainment on board leaves a lot to be desired. It’s not enough just to play music, they also show films at the same time. On one bus, they played Flight. The sound was so quiet that even if I could have understood the Spanish dubbing I couldn’t hear it. I gathered the gist of the story: Denzel Washington was high and drunk when flying a plane, became a hero when he landed the plane in a miraculous crash landing (thanks to our bus driver, I had a proper simulation of the crash landing experience) with the death of just one flight attendant, then cracked under the pressure and went to jail when he admitted his sins. Next, Hijos de Mafia – the perfect film chosen especially to suit the two young children sitting in the front, watching attentively. This one I really enjoyed: they all ended up shooting each other, and there was poetic justice at the end when a young man shot his old mentor. Ah the mafia. And finally The Terminal with Tom Hanks. For this one, the monitor was behind me but the Spanish voices blared out from the speakers right above my head. It seems you can have picture or sound but never both. On the last leg to Chiclayo, I had the company of a Dutch guy who had also been on the same bus as me the day before. We had bought our tickets separately but were given seats 3 and 4 at the front of the top level – the tourist seats? 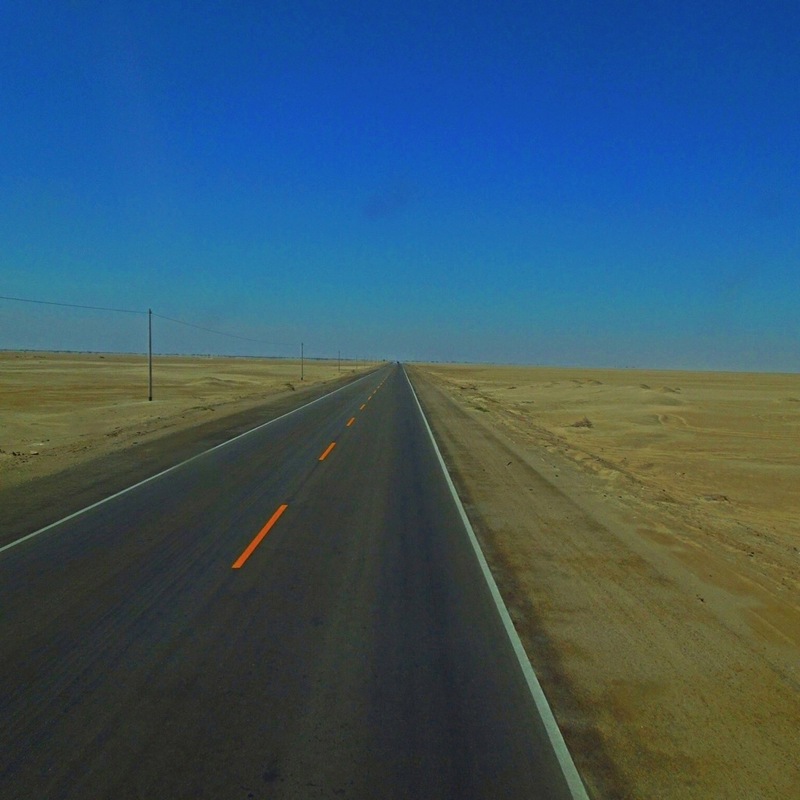 – and had great views of what turned out to be one long, straight, road, the Panamericana, with desert on either side. Sheesh. Way to make a girl feel old. I almost pointed out that women have their sexual peak in their 30s, men at 18. But I thought that might be a bit forward given we’d just met. On a side note: Following my ‘lone traveller’ post, you’ll all be happy to hear that I invited two English boys to my table for dinner yesterday and afterwards we had a beer together. So I wasn’t alone last night. After a week in the Galapagos, my dad and I spent an extra night on Santa Cruz island in Puerto Ayora and then took a flight back to Guayaquil. Nothing much to report there as we only really saw the airport and the food court at a nearby mall. We had a final cocktail together and then he headed off to amateur radio land in Ohio. My next stop was Cuenca, a city that lies about 2,500m above sea level, its historical centre listed as a UNESCO World Heritage Trust site. It was a five-hour bus ride with an automatic door between the driver and the passengers that said: “Más vale perder un minuto en la vida que perder la vida en un minuto.” Better to lose a minute of your life than your life in a minute. I would have to agree with that. I stayed at the Cofradía de Monje, the Brotherhood of the Monk, in a gorgeous building located across from the new cathedral. Right next door was the Casa de la Mujer, its corridors full of craft stalls, unfortunately most of them closed. In fact, I found as I wandered the streets of Cuenca that many shops were closed, though it was a Tuesday. I stopped off at the Café Austria and had an “antibiótico natural” smoothie and a chicken fajita. Yum. Next to me, a group of American professors were discussing the ethnography of the locals. One of them proudly described how she had only paid $3 instead of $4 for a taxi through town at night, a true sign of a local. The Museo del Banco Central is located in the castle of the Wicked Witch of the West and is free to the public. The ground floor housed an interesting exhibit on the overall history of Ecuador, with explanations in Spanish and Quechua, at times English and Braille. There was also a temporary photo exhibition on the Paso del Niño, a parade to celebrate the birth of Jesus on 24th December, during which cultural traditions come together with children dressing up as angels, bull fighters, and Santa Claus. The Museo del Sombrero has a huge Panama hat on the front, it’s hard to miss. Inside is a small but informative museum where the guide took us through the process of weaving, moulding, and ironing the hats. Most importantly, he explained that these are NOT, in fact, Panama hats. Produced in Ecuador as early as the 17th century, these straw hats went via the Panama Canal before being exported worldwide, picking up the name ‘Panama hats’ since they lacked any ‘Made in Ecuador’ marking to communicate their true origin. Their correct name, according to our guide, is ‘sombreros de paja toquilla’, after the name of the plant used to make them. 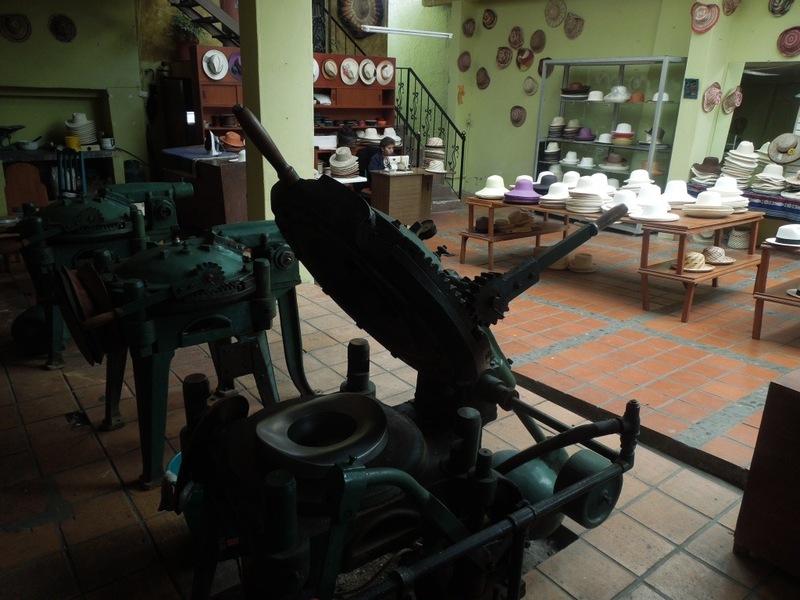 The museum is housed in the Rafael Paredes hat shop and there is a huge range to choose from once you’ve been convinced of their authenticity on the tour. First you must identify your size. Mine is XXL – tengo una cabeza grande but I knew that already. Next is the quality: standard, semi-fino, fino. The cost can range from $28 to $2,000 – the former takes two days for the women to weave, the latter several months, due to the fine nature of the fibres. The colour: natural or bleached to blanco. The style: a classic Panama shape, something with a larger brim for the beach, or something smaller for city life. And finally embellishments: the standard black ribbon or something more unique? After a lot of thought, I chose a Fedora model with a smaller brim, in size XXL of course, white, semi-fino, with a teal ribbon and brim. Though I must not have spent enough as my hat lost its shape after just a few days, even though I carried it carefully in my small rucksack. Harumph. When I went on a safari in Tanzania a few years ago, I was singing ‘The Circle of Life’, ‘Hakuna Matata’ and, of course, ‘The Lion Sleeps Tonight’, every step of the way. 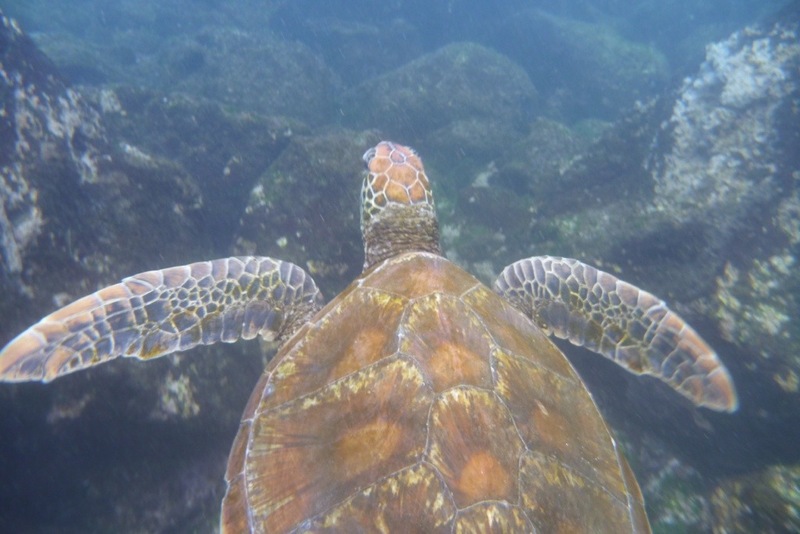 Likewise, while snorkelling around the Galapagos Islands, Finding Nemo quotes immediately floated to the surface. So when I found myself swimming with sharks, I couldn’t help but repeat: “Fish are friends, not food.” (Or better: HUMANS are friends, not food.) And swimming alongside the giant sea turtles, I swear I heard them say, “Duuuude”. I’m sorry Mother Nature, but Walt Disney & Co have contributed significantly to my education on the world around me. I’m definitely tempted to learn to dive now after this experience. I tend to be claustrophobic so I’ve been worried that all the scuba gear and the whole being-deep-under-water-and-not-being-able-to-breathe thing would be a very bad idea. But once I was in the water and exploring the world below, I actually felt quite free and at ease. The meeting of three major oceanic currents at the changing of the season from the hot, wet months to the cool, dry months meant that we would find ourselves in warm water one minute and cold the next, with the Cromwell and Humboldt coastal currents mixing together. We wore wet suits but I still found myself shivering after an hour in the water. Swimming in these waters was like swimming in a massive aquarium. On our first outing, I saw a school of small fish swimming by, shining in a blueish silver; countless other species in blues and yellows and greens and oranges feeding on the coral; a group of eagle rays soaring majestically past; and beneath us, the sharks passing back and forth, seemingly unconcerned by the strangers above. On subsequent excursions, the captain of the Nemo II, who turned out to be a snorkel-meister, had a mad tendency of swimming into dark caves and then signalling to us if there were sharks. On one swim, I finally saw the hammerhead. On another, we frolicked with the sea lion pups (but beware the adults, who can be aggressive). Even the landscape itself was captivating: the coral (although much of the coral reefs around the Galapagos Islands have been wiped out by El Niño-Southern Oscillation, the anomalous warming of the ocean water temperatures), the volcanic rocks… and, living among them, the various starfish, sea urchins and sea cucumbers. My favourite echinoderm: the chocolate chip star fish, a perfect cookie with milk chocolate chips arranged in a geometrical pattern. The real highlight, though, was swimming alongside those huge Galapagos turtles: they are so incredibly cool, chillaxing in the ocean for hundreds of years, not a care in the world. And, on the final day: a Galapagos penguin, one of the smallest of its species but very quick in the water. No, I’m not going to tell you how I met a handsome Ecuadorian skipper, sorry to disappoint you. I’m going to tell you about the mating ritual of the blue-footed booby. 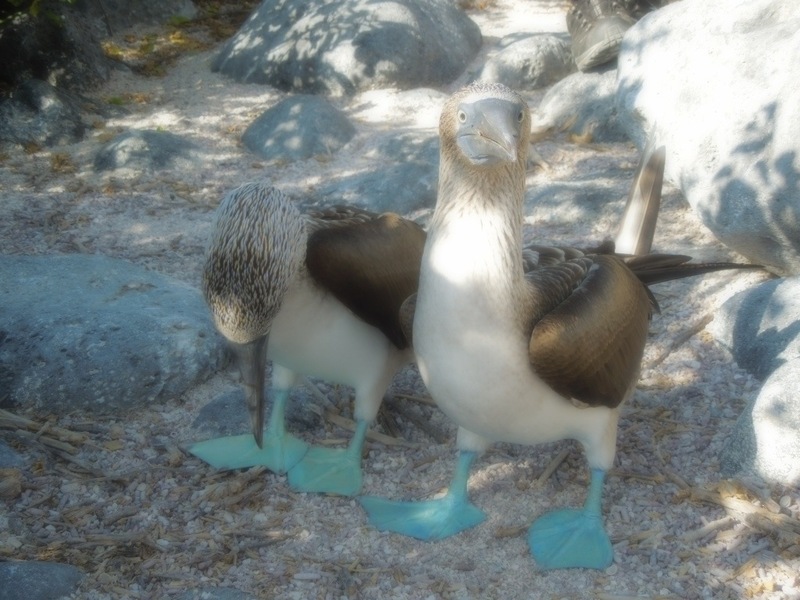 The blue-footed booby (its name unfortunately giving rise to a regrettable number of “I love boobies” t-shirts available to buy on the Galapagos Islands) develops its eponymous blue feet when it reaches sexual maturity, in order to attract a mate. The male will ‘dance’ (I would argue it’s more of a waddle) and whistle to attract its chosen female, who will join in the dance and honk loudly if she returns his affections. As romantic as this sounds, the act itself is over in just a few seconds, and the next mating season the male will find a new partner to try on his moves. At least they only have one dance partner at a time. For tortoises, on the other hand, the sexual act can last as long as two hours. Thank goodness for that, as the females can sometimes travel inland for several days in order to mate with the male of their species. The famous Lonesome George, who unfortunately died last year, was introduced to two females, Georgina and Georgette, towards the latter part of his life. He refused to mate, probably because he was too old and had lived alone for too long. Another tortoise, Diego (so named because he was brought across from the San Diego Zoo where he spent his early life), proved rather more ‘active’, fathering at least 1,600 offspring with various females. Unsurprisingly, given such a high number of offspring, these tortoises are rather negligent when it comes to child care. The female’s duties end once she has laid the eggs – she has no further responsibilities to look after or educate her children, who must fend for themselves as soon as they are hatched. The sea lion is also polygamous, and the male can have a harem of as many as 20 females on its territory. Although the male is sexually mature already at four, he can only start mating once he is strong enough to take care of his women and his territory, and to protect the pups from predators such as sharks. Actually, the females are free to leave to find a new guardian – they will stay only as long as they feel sufficiently protected by the strength of the alpha male. And as the bull must remain on round-the-clock patrol duty, going without food or sleep for several weeks, he will eventually tire and be beaten by a new challenger who will take his place. The males die younger than the females, with high levels of testosterone making for an aggressive and stressful life. The females, on the other hand, must pay for the protection they receive in sexual favours: they can mate already 15 days after giving birth in order to satisfy the male, with delayed implantation meaning that the embryo lies dormant for another three months, by which time she is ready to be pregnant again. In a very different dynamic, the female Galapagos hawk is larger and stronger than the male and chooses to take two or more lovers at a time. She sits on her nest and orders them about, and when she lays her two eggs, she doesn’t know who the father is. Not a model to aspire to, in my opinion. Look, instead, to the monogamous albatross, with perhaps the most human approach to mating of all the animals on the Galapagos Islands. Once it finds its soul mate, it stays with that one partner for life. The male and female also share parental duties in an exemplary way, taking it in turns to incubate the egg. A system the Swedes would be proud of. Finally, then, Homo sapiens: on the third night on board the Nemo II, Claude from Switzerland proposed to his girlfriend Rahel with a bottle of champagne and cake for dessert with “Casate conmigo. Te amo” written in icing, to the tune of ‘Somos novios’. The ring he gave her had been made by the children in the foundation where they are both doing voluntary work. She said yes. We celebrated with two bottles of white wine that Claude had generously bought for the rest of the passengers and crew.